A friend and I visited Horseshoe Curve, near Altoona, Saturday. I have long wanted to visit this famous railroad landmark, but, before now, although I had traveled over the Curve, I had never gone there for train watching. It turns out that late Saturday afternoon is not the best time for seeing trains, but several did pass by, including the westbound Pennsylvanian. Standing near the tracks in the area provided for viewing trains is a very special experience. You can see a train that nearly wraps around you—the same train in front of you, but also to your right and left. It is a weird and awesome encounter. Somewhat surprisingly, most of the visitors to Horseshoe Curve Saturday afternoon were Amish (or Mennonite or some such—I was too polite to ask what group these people belonged to and too ignorant to discern their affinity from their dress). I mention this only because my best photograph of the day included several of these visitors. Undoubtedly Amish (Amish are subset of Mennonites---though the Amish themselves are subdivided into literally *countless* sub-sects!). I lived for 5 years---and did my doctoral research---in this area. Good times! 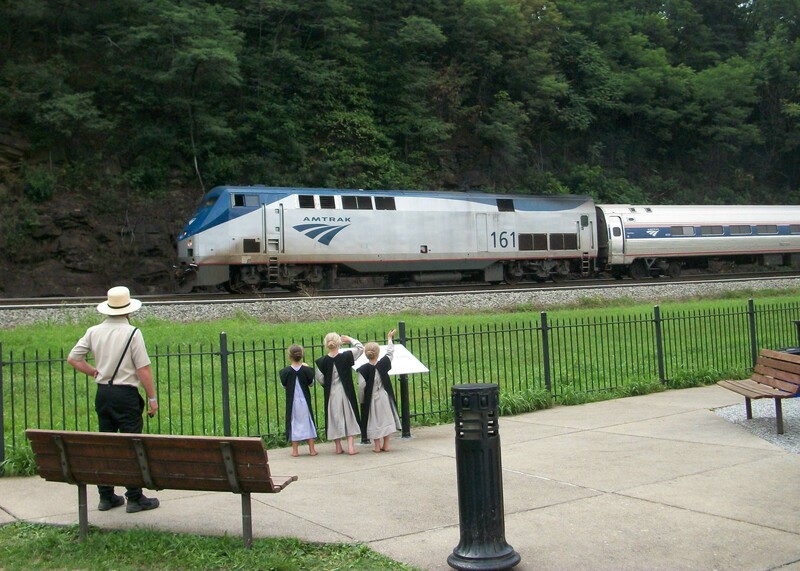 (Mostly) Went over the Horseshoe Curve on Amtrak several times, but never actually went to the viewing area. Wonderful photo. Thanks for the memories, Lionel. That is one of our favorite places. We went there as part of our 10th anniversary vacation. I got a great shot of Sue-z as a train went by.